A Killer Whale leaps out of the water during the Sea World of Orlando show, Believe. 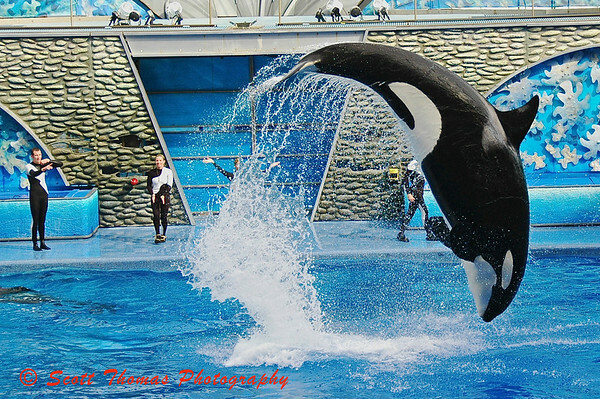 This entry was posted in Animals, Travel and tagged believe, florida, jump, killer whale, leap, mammal, orlando, Photography, sea world, show, water, whale. Bookmark the permalink. Well it’s good to know that I’m not the only one that had to take many shots to get one good one. This one is perfect timing. Great photograph Scott. But I disagree with dolphins and killer whales being kept in captivity just for human entertainment. I agree with Yesbut. But on the other hand, it seems as if they like it. They wouldn’t do all these tricks if they were ‘sad’. You would have a wonderful time trying to capture the grace and beauty of the killer whales in the Saguenay fjord. What amazing creatures. That is a striking image. You had your timing down. This is an awesome motion shot! Wow!